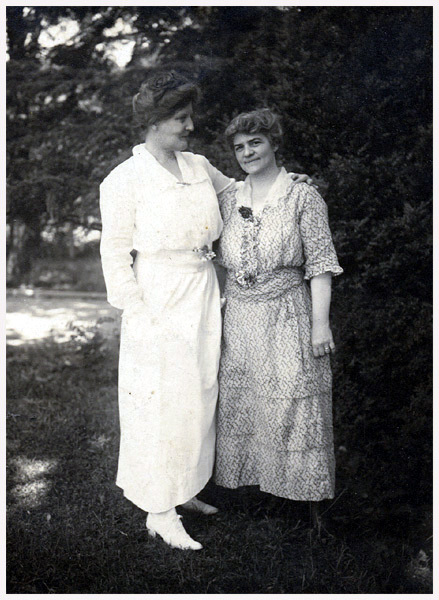 Comments: Helen (Burgess) Pitts poses on the grounds of Belle Haven with her friend, Mrs. Evan Chesterman. Helen (at left) was the wife of Captain John Lee Pitts of Scottsville and the sister of William Edward Burgess. William Burgess made it a family custom to give his photographs as Christmas gifts, and on the back of this gift to Helen is this inscription in his handwriting: "Merry Christmas Sister Mine - Willie." According to The Scottsville Sun, dated November 8, 1951: "Mrs. Pitts, the former Miss Helen A. Burgess, was born near Howardsville, but spent much of her life in Fluvanna County before coming to Scottsville. She has always been an enthusiastic gardener and did much of the landscaping and planting at Belle Haven, which abounds in beautiful shrubs and trees. She was a charter member of the old Scottsville Garden Club which was responsible for the planting of trees along the main streets of Scottsville and the landscaping around the High School." "She has been a life-long member of the Scottsville Methodist Church and taught Sunday School there for about 12 years. Since the time of her husband's death, she has not been as active in community life, she says, but spends some of her time traveling, visiting friends and relatives. The photographs that surround her attest to her devotion to her children, some of whom are living close to home."